Get your deep green vegetables at breakfast! 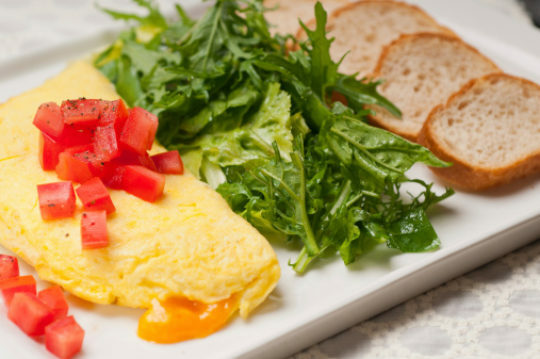 Enjoy an omelet “scrambled style” so you don't have the stress of flipping it correctly. This is a quick everyday high-protein breakfast, as well as perfect for company. Coat a sauté pan with non-stick cooking spray; heat over medium-high heat. Add the spinach and dried onion and sauté for 2 minutes (spinach will shrink down to almost nothing). Add the Egg Beaters, cracked pepper and dill weed. Stir until the eggs are almost completely set. Add the chopped tomato and feta cheese for the last one minute of cooking time. Serve with whole-grain toast and sliced fruit.